Football food: Try these recipes for meatballs at your Super Bowl party. Watch football on Super Bowl Sunday, but eat meatballs. Make these meatballs, pour over the sauce, and bake. These are not your Mama’s meatballs, or even your Grandma’s, but this is a throwback concoction that’s spicy and different — the kitchen equivalent of the Philly Special. In a saucepan, without turning on the heat, mix the dill pickle juice, salsa, Sriracha, Worcestershire sauce and salt. Stir in the cornstarch, and mix well. Turn on heat. Bring to a boil, then lower heat to medium-low and cook for a minute or two until sauce thickens. Stir in the pickles. Set aside. In a bowl, combine the meats, potatoes, onions, garlic, green pepper, parsley, salt and pepper. Shape mixture into balls, and put into a well- buttered 11×7-inch casserole dish. 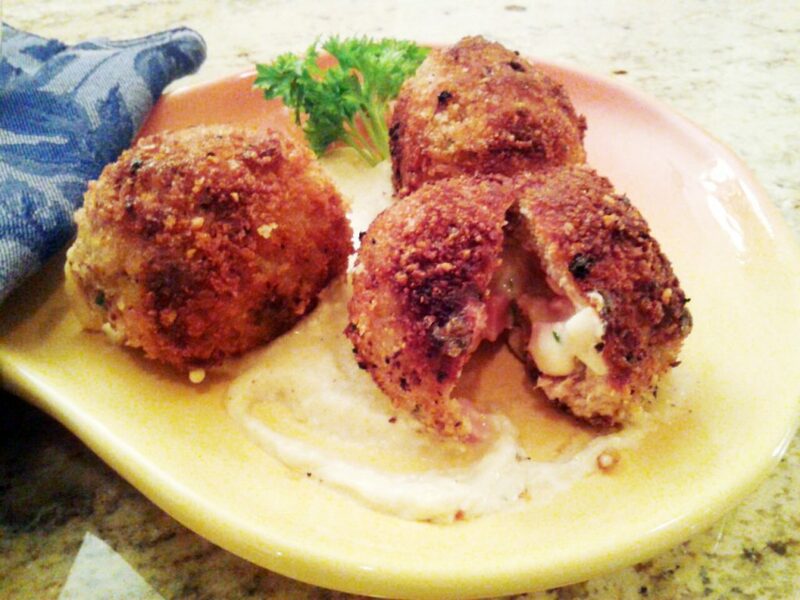 This recipe is a turkey meatball version of Chicken Cordon Bleu. Cheese and ham are wrapped inside turkey meatballs and served along with a creamy sauce. In a bowl, mix together the turkey, salt, pepper, egg, ½ cup bread crumbs and parsley. In a small bowl, mix together the chopped ham and mustard. Divide turkey mixture into 12 equal portions. Form meat into ball, and make a depression in the middle of the ball with your thumb. Add a cheese portion into the ball, and place a teaspoon of the ham mixture on the cheese. Form the turkey mixture around and over the cheese and ham, rolling gently in your hands to re-form into a meatball with cheese and ham enclosed. Repeat with remaining meatballs. In a flat soup bowl, mix the egg and water. On a sheet of wax paper, mix together the breadcrumbs and the Parmesan cheese. Gently roll each meatball in the egg mixture, then roll gently in the breadcrumb/Parmesan mix, coating the meatballs on all sides. Heat the oil in a heavy frying pan. When oil is hot, place the meatballs in the pan, but avoid crowding them. Turn them gently so all sides are cooked thoroughly. Repeat with second batch, if necessary. Drain cooked meatballs on a paper towel-lined, oven-proof plate, and put them in a 200-degree oven while you make the sauce. Let the pan cool somewhat, then carefully pour off any remaining oil and wipe out the pan to make the sauce. Melt butter over heat in a saucepan. Blend in the flour, stirring constantly over low heat. Cook for 1-2 minutes. Slowly add the chicken broth and then the milk, stirring constantly, and cook for a minute or two until sauce thickens. Add the mustard and the Worcestershire sauce and stir. Add salt and pepper to taste. Return the meatballs to the frying pan, and place on top of the sauce.